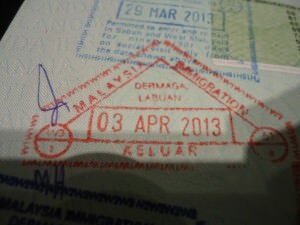 World Borders: How to get from Malaysia to Brunei – entering Brunei at Serasa. In my ongoing series of world borders, I prove how easy it is to travel the world, cross borders into new countries and get visas. 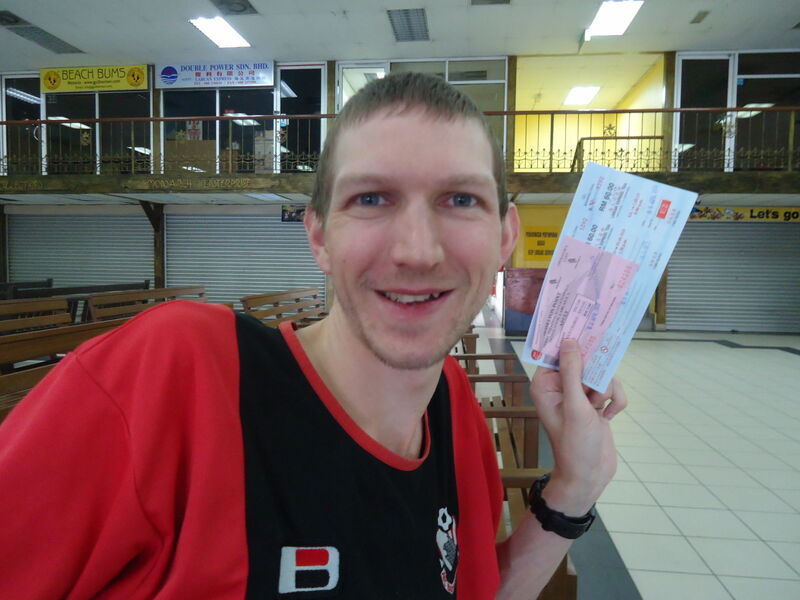 This post is all about getting from Malaysia to Brunei Darussalam on the island of Borneo. Obviously there are many different ways to cross this border, but for the basis of this post I am writing about the crossing from the Malaysian island of Labuan to Serasa ferry terminal near Muara in Brunei. This also involved getting a ferry from Kota Kinabalu out to Labuan to begin with, so it was a two ferry border crossing in essence. As world borders go, this is an easy one to organise and get across, plus it’s an exciting one and you have the bonus of seeing Labuan! The border crossing from Labuan to Serasa in Brunei is by ferry. 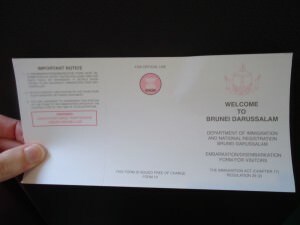 Do you need a visa to visit Brunei Darussalam? OK again this varies from country to country and I can’t possibly cover all passports but I travel with a British and an Irish passport and both are absolutely visa free to enter Brunei. 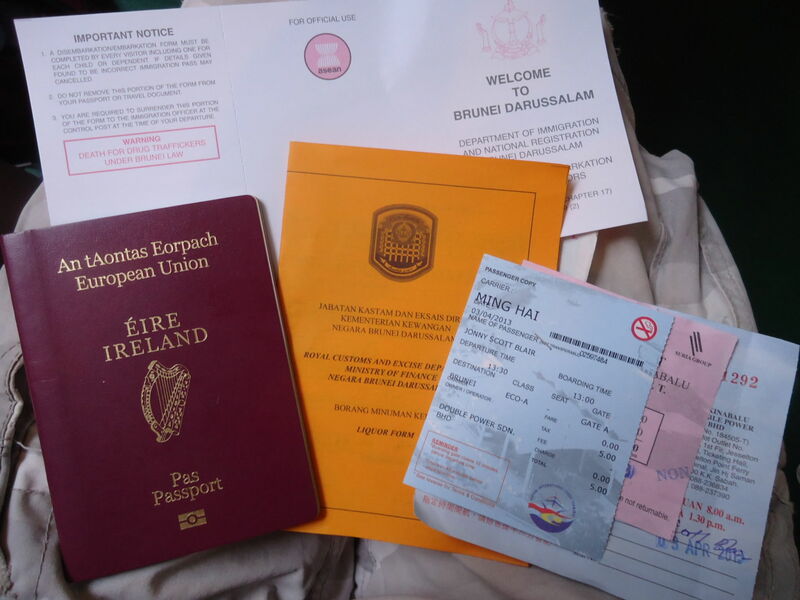 There is no visa required and no cost for British or Irish citizens to enter Brunei. It’s free. Immigration form for Brunei Darussalam – fairly straight forward. There is just a simple immigration form and passport stamp on arrival. 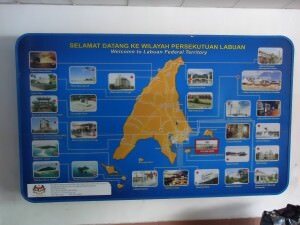 It couldn’t be simpler – you get the immigration form in the Malaysian port of Labuan, you can also get it on the ferry or on arrival into Serasa ferry terminal. 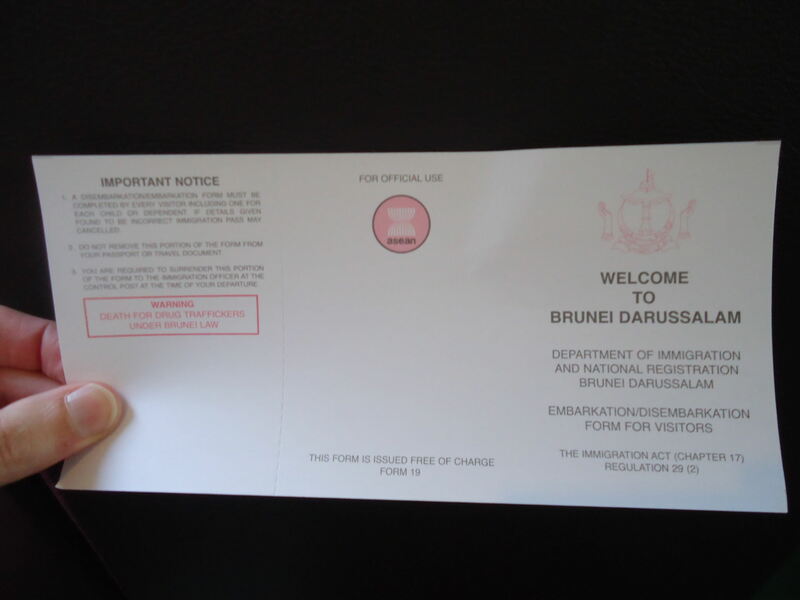 The other side of the immigration form for Brunei. You will get a Malaysian exit stamp at Labuan. 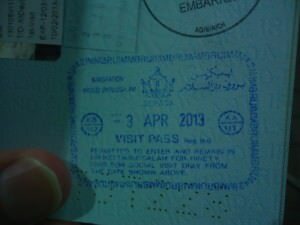 You will get an exit stamp in Labuan, West Malaysia and Sabah before boarding the ferry. 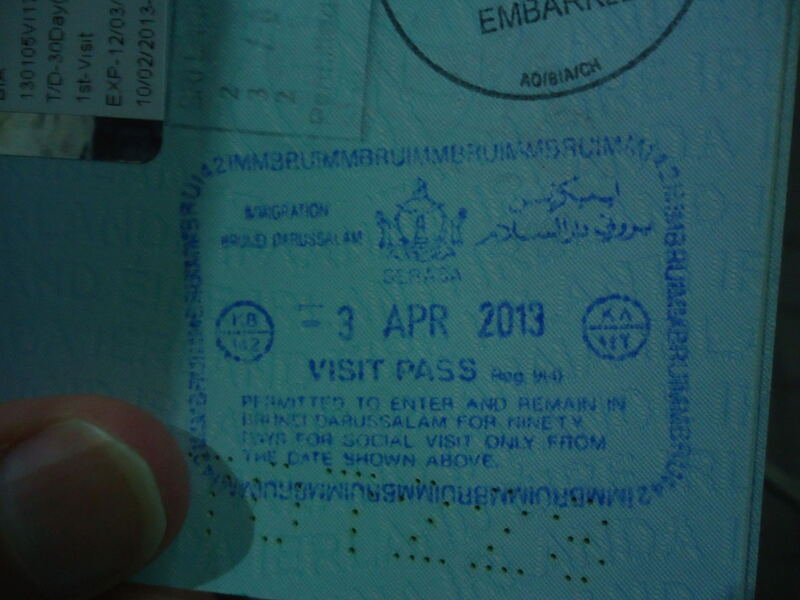 My visa stamp at Serasa in Brunei which gave me 90 days in the country. You will get an entry stamp and 90 days on arrival at Serasa, Brunei, but unless you’re working there or visiting a local, there will be no need to stay that long! How do you get from Kota Kinabalu to Brunei? OK I’ll cover the trip in detail here. The best way to get from Kota Kinabalu to Brunei is by taking two ferries. 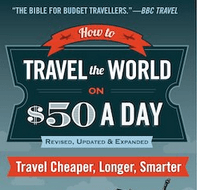 This has its bonuses and is much quicker and easier than going overland by bus. 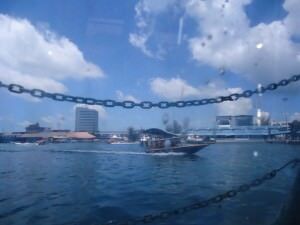 If you have time to play with, by all means go by bus, but trust me the Kota Kinabalu to Serasa double ferry option is great. 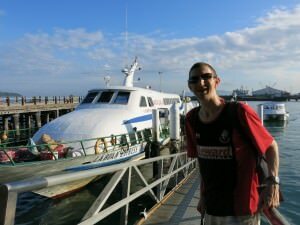 Boarding my first boat of the day from Kota Kinabalu to Labuan, MALAYSIA. 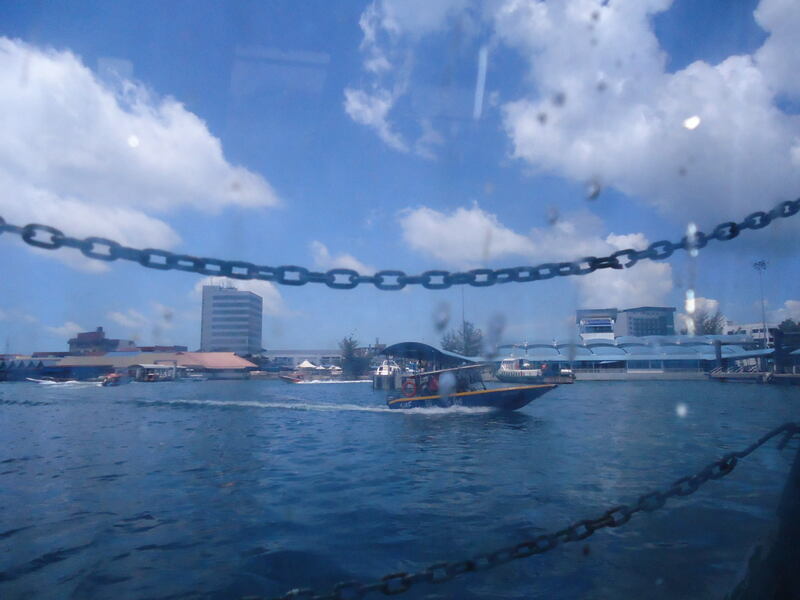 First ferry – Leaves from Jesselton Point, Kota Kinabalu and takes around 3 hours to arrive in the port of Labuan on the island of Pulau Labuan, MALAYSIA. Second ferry – Leaves from the port of Labuan on the island of Pulau Labuan in MALAYSIA and takes around 1 hour to arrive into the port of Serasa near Muara on mainland Borneo in BRUNEI DARUSSALAM. 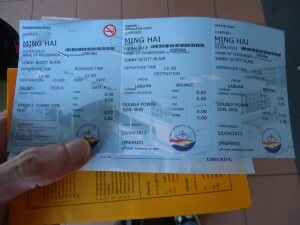 With my double ferry tickets at Jesselton Point, Kota Kinabalu, MALAYSIA. 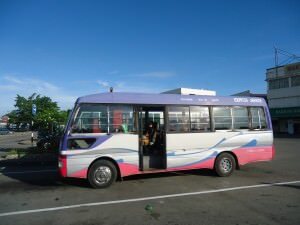 In between the two ferries you have two main options – option one is just spend a few hours in Labuan, the other option is to stay overnight, or stay a few nights to break up your journey. On the way to Brunei you have the bonus of exploring the island of Labuan, MALAYSIA. 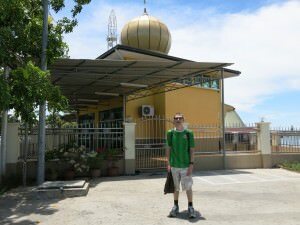 A mosque in Labuan, Malaysia. How do you get from Labuan to Brunei? So as mentioned you will most likely have left Kota Kinabalu and arrived on the island of Pulau Labuan, more commonly known as Labuan. 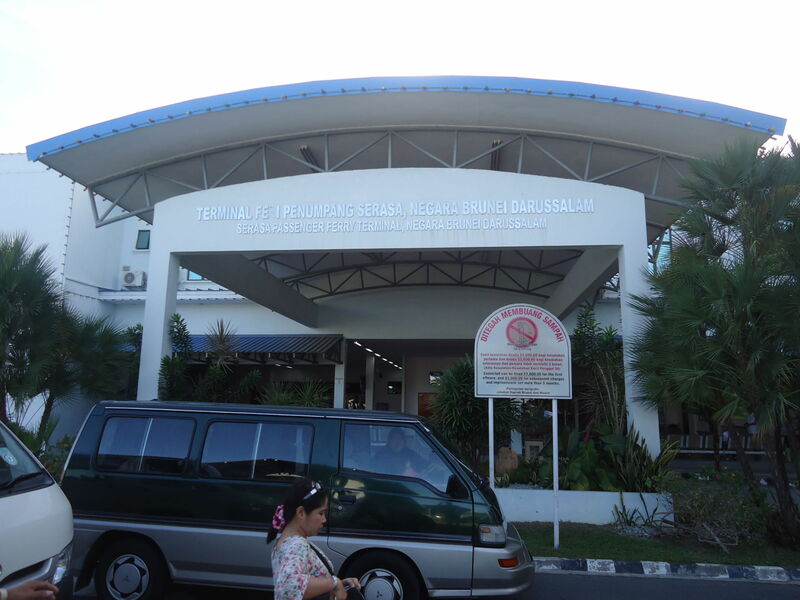 The only option to get from Labuan to Brunei is by ferry and all the ferries leave from the port of Bandar Labuan (often just called Labuan, the same as the island name of Pulau Labuan) and they arrive in the Serasa Ferry Terminal near Muara in Brunei. Serasa is a remote ferry terminal and is not in a town. There is no option to get a direct ferry to Bandar Seri Begawan the capital of Brunei. Once you get there you will see why – it’s not easily accessible by water as the waterfront has a shallow river, which runs through an estuary. 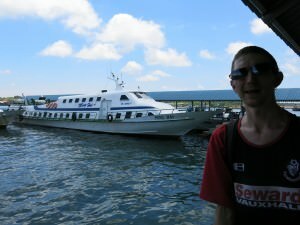 Boarding the ferry in Labuan – the Ming Hai Express to Serasa, Brunei. How do you buy tickets for the ferry to Brunei? Get them from the ticket desk and ticket office in either Kota Kinabalu or Labuan. There is no real need to book in advance as the ferries are regular during the day and are rarely full. Brunei is not a major “backpacking hub” so if you’re a long term traveller or experienced backpacker, you’ll love the experience of it! 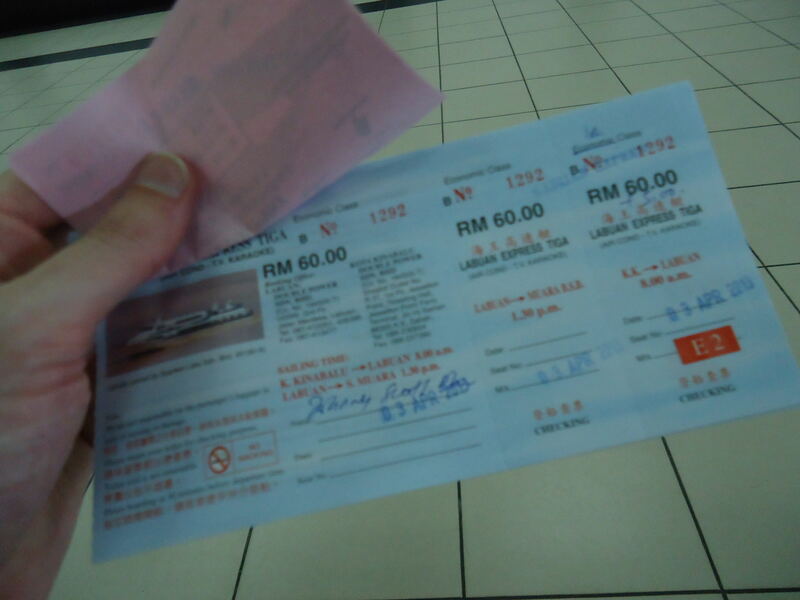 Queuing up to buy our tickets from Kota Kinabalu to Labuan and onwards to Serasa in Brunei. First ticket bought in Kota Kinabalu is for 60 Ringitts, the extra 8.60 is for tax. 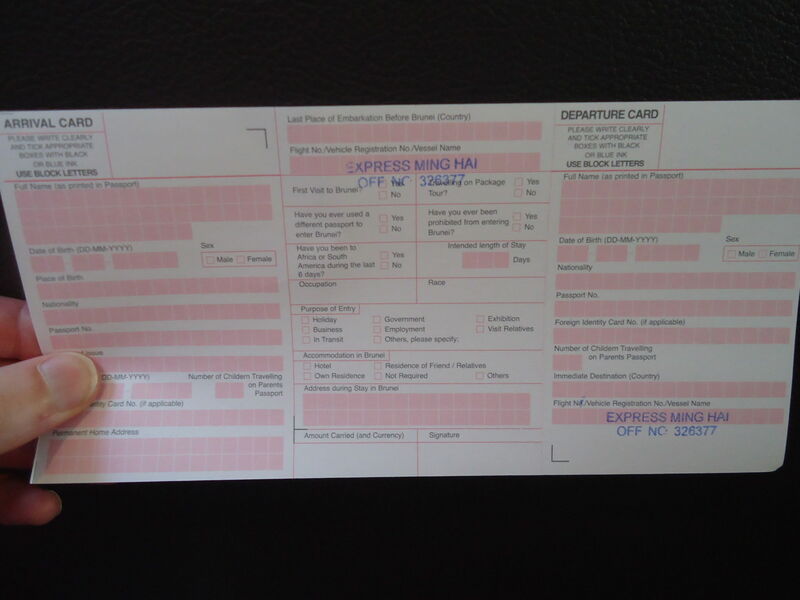 My tax ticket which I bought in Labuan – it’s only 5 Malaysian Ringitts. 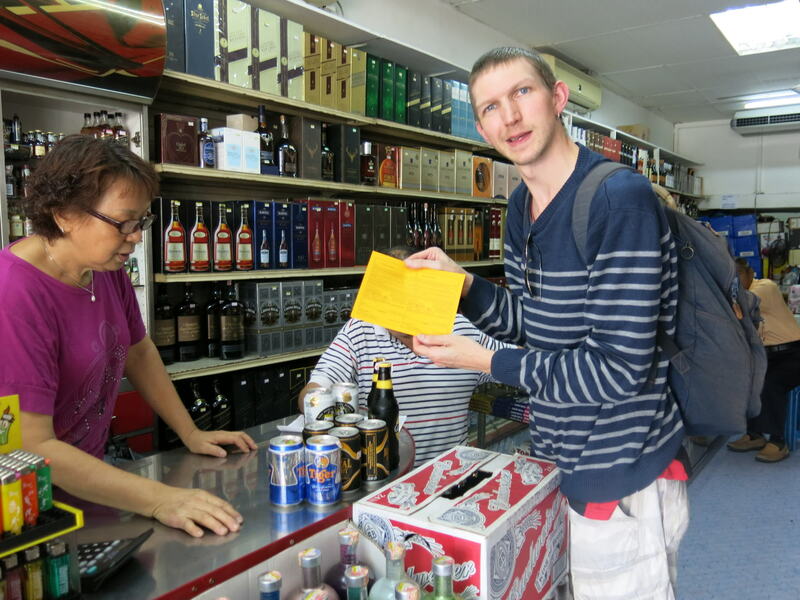 Can I bring alcohol into Brunei Darussalam? Yes you can! Brunei is a completely alcohol free state and the state religion is Muslim. However non-Muslims are permitted to bring an allowance of alcohol in with them, which I’d recommend doing. I wrote in depth about this here: how to take alcohol into Brunei so check that post out! 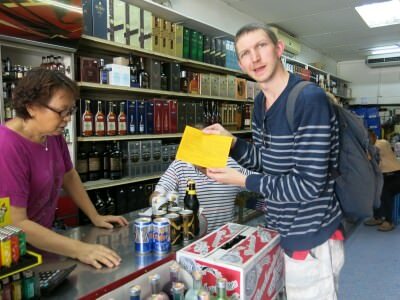 Yes you can take alcohol into Brunei with you! Buy it in Labuan and fill in a customs form. Apart from Labuan what other routes are there from Malaysia to Brunei? 6. Flying – you can fly into the international airport in Bandar Seri Begawan from other airports in Malaysia and further afield. Literally all you need to get into Brunei from Malaysia! 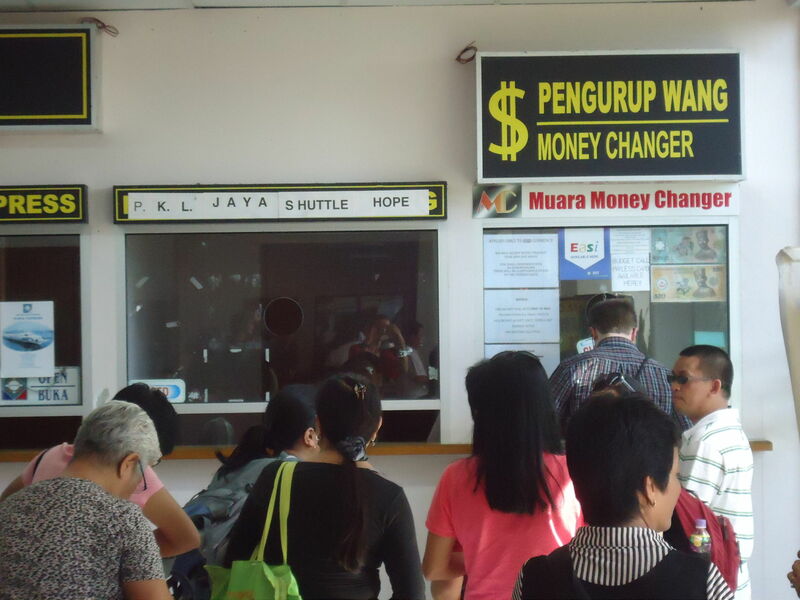 There is a money changing facility at both the Malaysian ferry port on Labuan and the Serasa ferry terminal in Brunei. There are no ATMs in Serasa ferry terminal, so I’d actually recommend getting some Malaysian Ringitts changed into Brunei Dollars in Labuan, which is what we did. 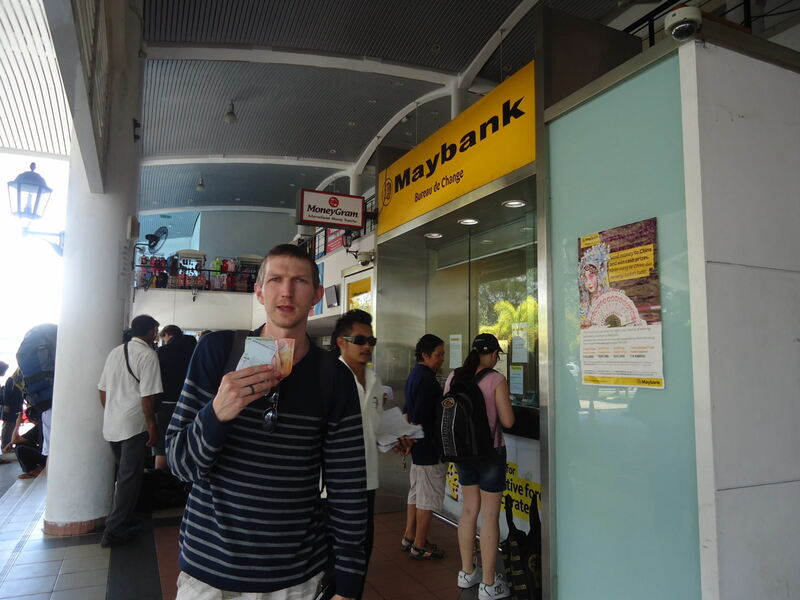 Getting some money changed in Labuan, Malaysia. Once we got to Serasa in Brunei, the Money Chyanger was actually open anyway but don’t count on it. 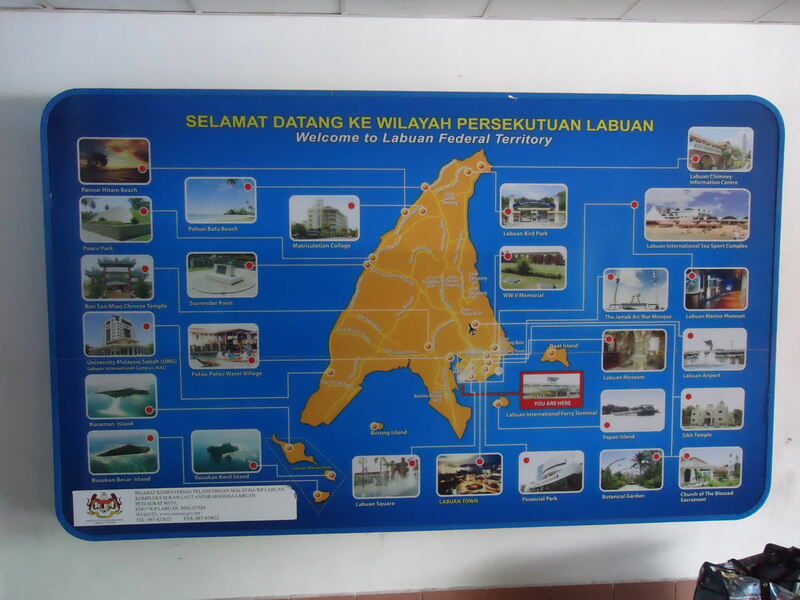 Please note that Labuan also has Mosques and a Muslim population and therefore the Money Changers are sometimes closed for prayers during the day. If this happens, there is a money changing facility in the main town, try the banks or oddly…a silk and linen shop. The Money Changer at Serasa in Brunei. What currency do they use in Brunei Darussalam? Officially it is the Brunei Dollar, but you can also use the Singapore Dollar which is fixed at the same rate as the Brunei Dollar. If you get stuck, I’d imagine some places accept US Dollars or maybe even Malaysian Ringitts. 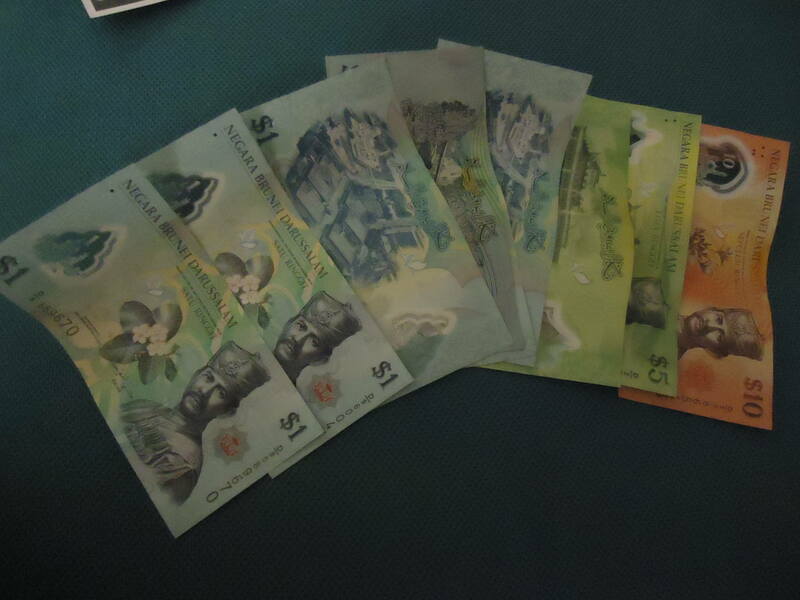 But if you want my advice – stick to the local currency – use Brunei Dollars throughout your stay. Brunei’s Official Currency is the Brunei Dollar. 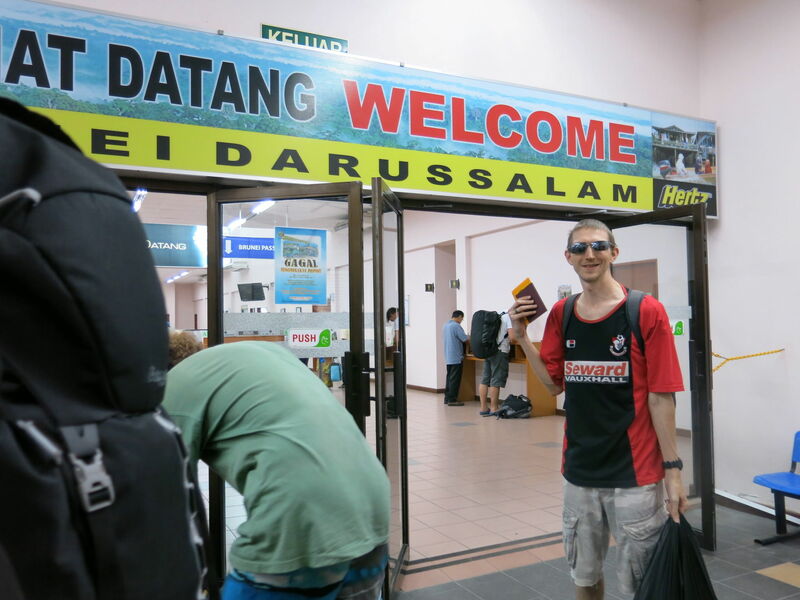 What do you do once you arrive at Serasa Ferry Terminal in Brunei Darussalam? OK first of all you get your bags off the boat and head to the immigration checkpoint. It’s fast and efficient, get your passport stamped and you’re in the country. Then you hand over your Liquor Form for alcohol if you have one. Then it’s up to you. Entrance to Serasa Ferry Terminal but there isn’t a lot you can do nearby! The main thing to note however is that Serasa ferry terminal is remote and not really in a town or village so staying nearby is really not an option. If you really wanted to stay out in the sticks you could try staying at Muara which is served by a local bus. 2. 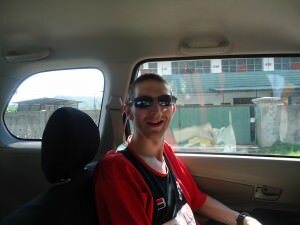 Bite the bullet and get a taxi to Bandar Seri Begawan but bargain like hell! The taxi drivers start off on $40 but we just sat down and read our books and had a drink and ignored them until they finally said $25 – I said no way mate but if it’s $20 you have a deal. This was after an hour of waiting around trying to save money. 3. Hire a car. Ultimately this could cost you more and you might get lost. The local bus that stops at Muara and then you change and go to Bandar Seri Begawan. 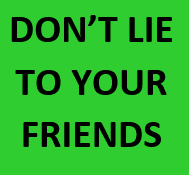 My girlfriend and I are fairly seasoned travellers and we don’t really fall for scams or trust people very easily, so it was a big surprise when taxi drivers and their mates tried to give us fake information straight away!! Not in so many words I told them we weren’t interested and to go away. They were basically lying to us and some fellow travellers from Norway, by telling us the buses had finished for the day and the only route into town was by taxi. We knew it was a lie as it had just gone 3pm, and our research had told us that buses run until 6.30 pm and that they only cost $1 Brunei Dollar. In the $20 taxi in Brunei from Serasa to Bandar Seri Begawan. After waiting for an hour indeed no bus turned up, but we believe when we finally got our $20 taxi that a bus was probably on its way. We didn’t have the time to waste. But just be mindful of the lying taxi drivers. There are buses, just not many of them and one an hour is lucky. – There is NO alcohol on sale in Brunei so if you want to drink there you need to bring it in from Malaysia. – Labuan is a duty free island and is worth stocking up on beers, spirits and tobacco products. 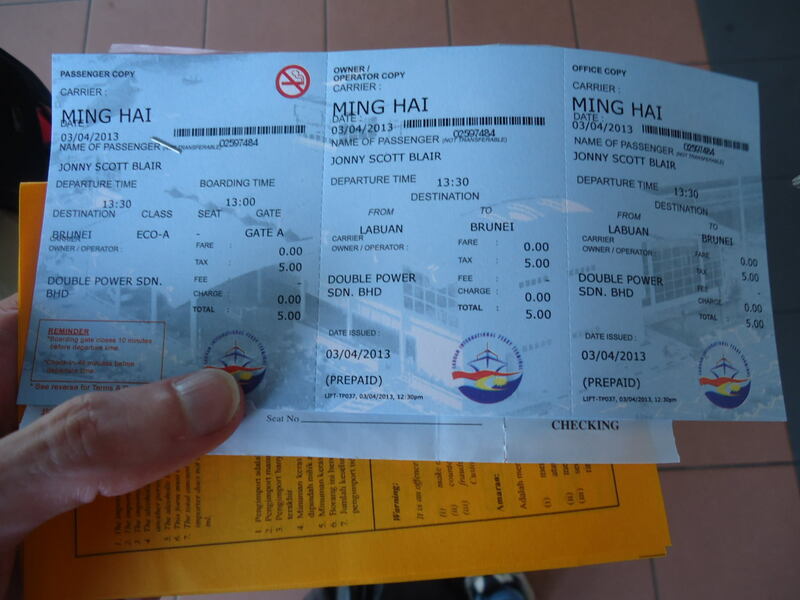 – There is a 3.60 Malaysian Ringitts departure tax for leaving Kota Kinabalu by boat. – There is a 5 Malaysian Ringitts departure tax for leaving Labuan. 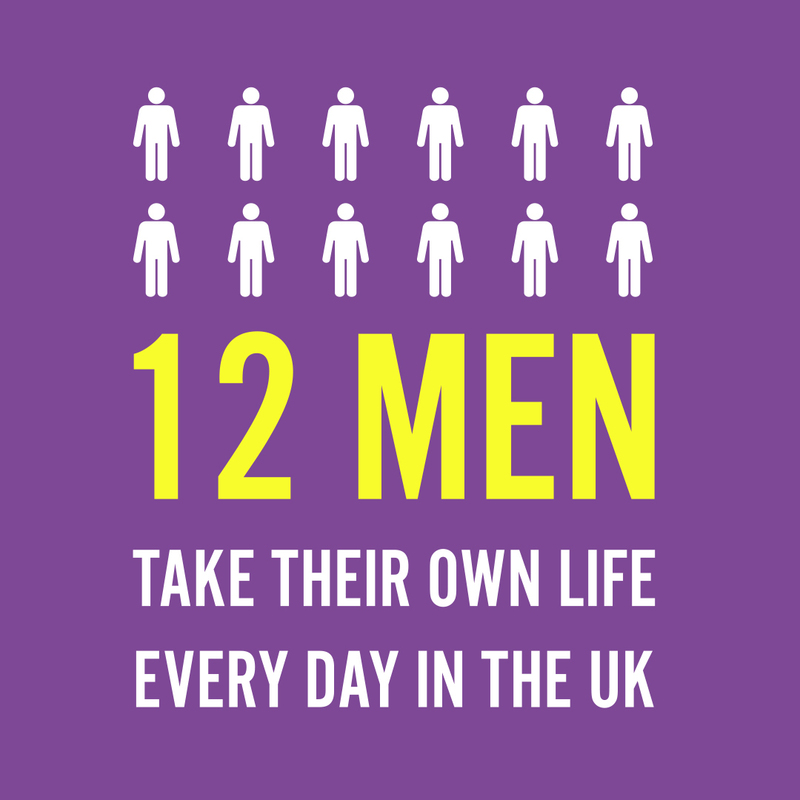 – Drugs are illegal in Brunei and trafficking will result in death. That’s how to get from Malaysia to Brunei!! Safe travels folks! This entry was posted in Asia, Borneo, Brunei Darussalam, Destinations, Labuan, Malaysia, Sabah, Serasa, World Borders and tagged Serasa. Bookmark the permalink. Great info Jonny. 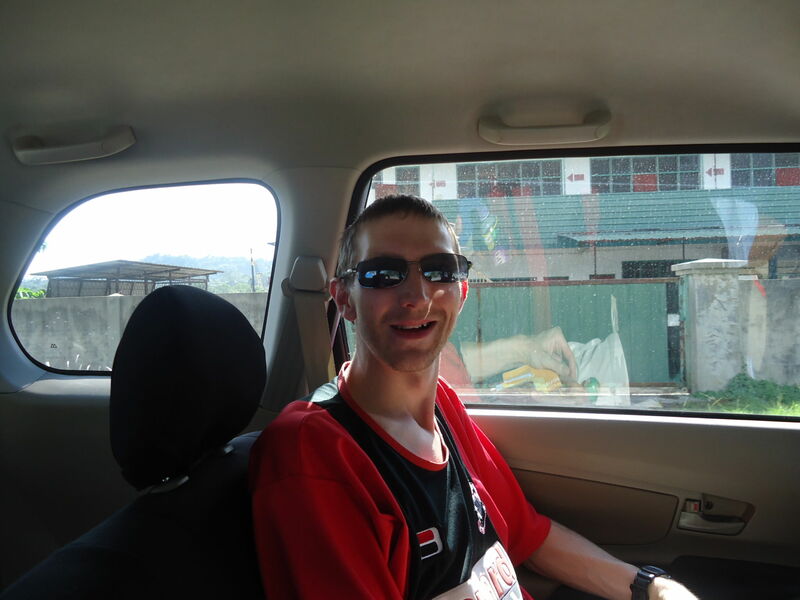 Do you have any leads for a guide or company for a trek across Borneo from West to East? Thanks for the very detailed write up on your travels into Brunei. I am very glad to bump into your blog, very well informative as I am a Malaysian but this entry of yours is so good. Well keep it up! just want to know, (as I planning to go to Brunei airport from Labuan) from changing bus in Serasa-Muara-Bandar seri Begawan then to airport can direct from Muara or have to change in Bandar seri begawan? Mr. Blair, can I know if there is a bus station at Serasa Ferry Terminal to Bandar Seri Begawan? Thanks and Godbless! Hi Jonny! Just wanted to quickly say thanks for the fab write-up and super detailed tips on your trip from KK to BSB 🙂 We’re headed there ourselves in about 2 weeks and, together with other travel resources, are pretty confident we’ll have a great time on the ferry — thanks heaps to you! On a side note, I’m curious… how many countries HAVE you been to now? And are you still travelling? Ha ha ha, I couldn’t agree more!! And am proud to say I’ve even been there 😉 Happy travels, Jonny! Try the sovereign order of Malta, a few buildings in Rome the only place the public can enter is it’s post office where you’re no longer in Italy. I’m up to 87 countries and semi autonomous territories. The UN is another strange one.I’ve been to transdinestria it has all the hallmarks of a country so I’d count it!not quite sure if you can separate Guernsey,sark and Alderney?